At a time when lawsuits and settlements are a regular occurrence in the financial industry, investors have grappled with how to get a handle on how much the country's biggest banks could still lose. Wells Fargo took its latest shot at estimating how much it could lose above what it's set aside money for, in its annual report filed today: $1 billion. That's a little less than the $1.2 billion the San Francisco bank estimated last year and in 2011. The bank calculates it by estimating a range of possible loss for its outstanding litigation, and setting aside money for what it believes is the most likely scenario. The $1 billion marks the high-end of the range. This is in addition to the $2.4 billion the bank estimated it could possibly lose on bad mortgages that securitizers could try to force Wells Fargo to repurchase. Of course, the estimate only accounts for currently pending litigation. At the bank's last quarterly earnings call, in January, an analyst asked whether CEO John Stumpf believed that more lawsuits would be coming. In its last annual report, covering 2011, Bank of America put its estimate at maximum possible loss at $3.6 billion. The bank's new annual report is expected any day now. Acquisitions speed up. Wells Fargo reported acquiring $4.8 billion worth of assets from other companies in the year, its busiest year in business combinations since it bought Wachovia in 2008. The largest acquisition, at $3.6 billion in assets, was the energy lending business of France's BNP Paribas, announced in February. The 2012 activity was more than eight times what it did the year before, when the bank bought $588 million in assets. Taxes. Wells reported paying $9.1 billion in current and deferred income taxes over the year, adding up to a 32.5 percent effective tax rate. That's up from $7.4 billion and 31.9 percent after a string of four quarters of record earnings. Salaries up, occupancy down. The bank's salary and commission costs increased again, hitting $24.2 billion in 2012, up 4 percent. But at the same time, Wells' office cost came down. The bank paid $2.9 billion in occupancy costs, down 5 percent from the year before. A shareholder proposal that would ban the use of Bank of America corporate funds for political purpose will appear on the bank's upcoming annual meeting ballot. Filed by advocacy group United for a Fair Economy, the proposal targeted spending like Bank of America's $5 million given to a committee associated with the Democratic National Convention last year or its contributions to industry groups that give to political campaigns. Bank of America had fought its inclusion, claiming it was too vague and was too similar to a different shareholder proposal already going on the ballot. The Securities and Exchange Commission ruled otherwise. Another shareholder proposal, which would require Bank of America executives to maintain a "significant percentage of shares" received as annual compensation until they reach normal retirement age. The goal was to focus executives' attention on long term stock performance. The bank had fought that proposal as well, saying existing policies covered the topic well enough. Proposals like these are regularly included on the bank's annual ballot, but rarely gain traction. Baird announced Friday that it is adding three financial advisors to its Charlotte-area wealth management team. Father and son team Joe and John Lipe will bring The Lipe Group over to Baird from Morgan Stanley Smith Barney and will be based in Charlotte. Kevin Phillips comes from Wells Fargo and will be based near Lake Norman in a new Baird office. Baird opened a Charlotte wealth management office in 2010 with four advisors. The company also has capital markets and an investment banking office in the city. Both are in Piedmont Town Center. Will Yadkin Valley Financial look for a buyer? With capital raised, troubled assets sold, and enduring profitability seemingly on the horizon, Yadkin Valley Financial Corp. could soon be looking for a buyer. At least that's the take from bank analysts at financial services firm Keefe, Bruyette and Woods, which added the Elkin-based bank to its potential sellers list this week. "They’re in the 7th or 8th inning of the turnaround there. I think they’re back to profitability from here on out. Their capital issue is resolved," KBW analyst Brady Gailey said. "That’s why you might see that board decide to explore alternatives sometime in the next year or two. There are a lot more buyers would be interested in it now that it’s a lot cleaner of a bank." He said banks like SCBT, Park Sterling and Capital Bank could be interested in buying Yadkin Valley. Yadkin Valley Financial has 34 branches in the Piedmont and mountain regions of North Carolina and in York and Cherokee counties in South Carolina. It runs American Community Bank in the Charlotte area. If you're looking for something on the record from Wells Fargo this week, you'll probably have to be in Charlotte: More than 175 Wells Fargo corporate communications members are in in the city for a conference. Social media and reputation risk are hot topics at the event, which drew Wells employees from around the world. The Duke Energy Center was lit up red and yellow Wednesday night to mark the occasion. The team also went to Strike City to put together more than 300 hospitality packets for families staying at the Ronald McDonald House in Charlotte, and gave another $1,000. Four years after Bank of America acquired Merrill Lynch, the Charlotte bank's commercial banking division is helping refer nearly half of Merrill's new assets in its retirement benefits products, Bank of America said Tuesday. It's the latest example of the bank's increasing emphasis on cross-selling products between its corporate divisions, and demonstrates an apparent success in the sometimes strained relationship between bankers at Merrill Lynch and Bank of America. The bank said Merrill Lynch added a record 6,000 financial benefit plans in 2012, totaling $24.3 billion in new assets. Clients of the commercial bank accounted for more than 60 percent of the new plans, and $10.6 billion of the assets. That's up from $700 million in new assets from those clients in 2009, $3.6 billion in 2010, and $5 billion in 2011. These benefit plans, served through Merrill Lynch, generally include 401(k), defined benefit, equity and non-qualified deferred compensation plans. The legacy Bank of America global commercial bank serves businesses with revenues of $50 million to $2 billion per year. One example of a new corporate client taking on a benefit plan from Merrill is a hospital system in central North Carolina, senior vice president Ken Burton said. "When Merrill Lynch was acquired by the bank, I always referred to it as synergy by addition," said Kevin Crain, head of institutional retirement and benefit services, in an interview with the Observer. "We can get introductions to corporations when it makes sense." Merrill Lynch's benefit team is based in Hopewell, N.J., and has another corporate office in Jacksonville, Fla. It has a sales force across the country, including North Carolina, and has a team that works with the commercial bank in Charlotte, Crain said. The commercial bank has a significant presence in Charlotte, Burton said. 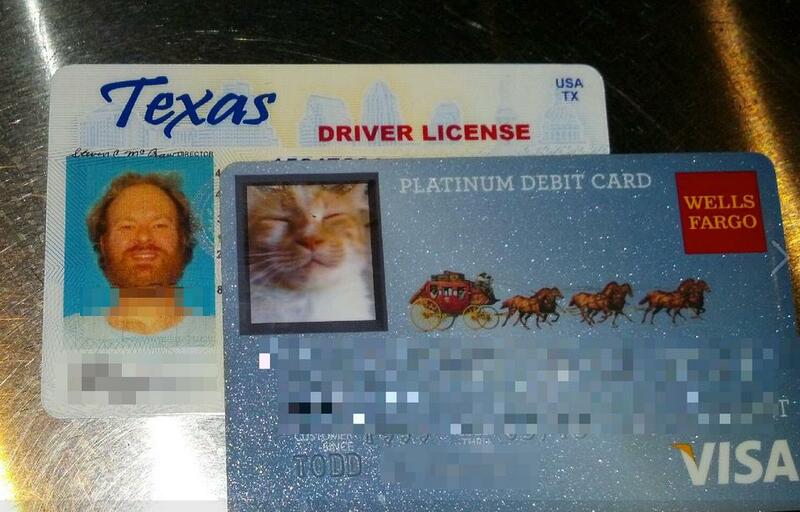 If you Reddit or Twitter or read Gawker or otherwise spend a lot of time on the Internet, you probably saw the thing about the guy who used a picture of a cat for the spot on his Wells Fargo debit card usually used for photo ID. The implication: Wells security is so lax that it can't tell the difference between humans and felines. But the bank says today that it's perfectly fine to use a cat picture on your debit card. "We certainly would be willing to admit it if we made a mistake, but the customer followed our guidelines and policies for including an image on his card, so it passed," Wells social media guru Doug Caldwell wrote on a company blog Friday. "The photo on the card isn’t a security feature, but a way for you to personalize your debit or credit card." The bank does have some guidelines. Naturally, sexual imagery is a no-no. You can't use a celebrity (sorry Beliebers). No gang signs, violent images or cartoon characters. Alive animals are OK, dead animals are not. But that leaves some latitude. Get ready for some weird stuff, Wells Fargo. Consumer advocates are protesting a bill filed Wednesday in the state Senate they say would re-legalize payday lending in North Carolina. The bill, introduced by Archdale Republican Jerry Tillman, would allow businesses to loan people money in advance of a paycheck, charging a maximum of 15 percent. But since most loans generally have a two-week term, both Attorney General Roy Cooper and the N.C. Justice Center note that the annualized interest rate on such a loan would be more than 300 percent. Current state law generally bans loans with an interest rate greater than 16 percent, aimed at eliminating payday lending. The bill passed a first reading Thursday and has been referred to a Senate committee. Last year, Charlotte's economy went from lagging the country as a whole to being the leader among similar-sized cities. In 2013, that growth is expected to accelerate, PNC Financial Services economist Mekael Teshome told the Observer on Thursday. The city's payroll growth has been driven by professional services, which encompass a number of office-based professions: accountants, attorneys, consultants and the like. The economy has also been aided by a stabilization of public sector jobs, Teshome said, and the worst is over for job losses in the financial services sector. Over 2013, the unemployment rate is expected to decline to 8.7 percent, from 9.4 percent, according to a PNC outlook. Teshome said he believes the housing market recovery "has legs," as well. PNC also has a positive long-term outlook on Charlotte. As is true in much of the Southeast, the Charlotte area benefits from in-migration and a relatively young and educated population. While 62 percent of the U.S. is between age 18 and 64 -- also known as the working age -- in Charlotte it is 67 percent, Teshome said. Ally Financial has finished providing the $200 million in principal forgiveness, short sales and other mortgage relief required as part of the $25 billion national mortgage settlement that went into effect just less than a year ago, the office of settlement monitor Joseph Smith said today. It is the first of the five banks to meet its obligations, though it also had a much smaller amount to provide. Bank of America, for example, is required to provide $8.58 billion in relief. Wells Fargo has to do $4.34 billion. Smith determined that Ally had provided $257.4 million, though the office did not provide a breakdown of how the final numbers broke down. Smith said in a statement that he would still keep up with Ally to make sure it is following the new servicing standards required by the settlement. All five banks were required to send Smith their reports on how much aid they've provided in the fourth quarter by today. A new report will be issued next week. The last one, which came out in November, showed that the banks had provided $26 billion in relief nationwide, though not all forms receive dollar-for-dollar credit toward their obligations. The bulk of the relief came through short sales. U.S. Sen. Kay Hagan has joined a few of her colleagues in sending a letter to banking regulators urging changes to a new rule defining qualified residential mortgages, her office said today. Specifically, the North Carolina Democrat is not in favor of requiring a 20 percent down payment -- a figure she believes could "price well-qualified Americans out of the market." The Consumer Financial Protection Bureau announced a proposed rule in January that sought to keep banks from making risky loans that borrowers would not be able to repay. To do that, it defines a "qualified mortgage," or one that adheres to debt-to-income ratios, down payment requirements and other benchmarks. Banks that make qualified mortgage are protected from lawsuits. Hagan's letter says that the rigid down payment rule was a misinterpretation of the Dodd-Frank financial reform law, which spurred the rule. Bank of America could soon get some more scrutiny from the Consumer Financial Protection Bureau as it sells $300 billion in mortgage servicing rights over the course of the year. Last month, Bank of America announced it was selling the rights to service 2 million mortgages, worth $306 billion, owned by Fannie Mae and Freddie Mac. The next day, Reuters reported the bank was looking to sell another $100 billion worth (though when asked about it later that month on its quarterly earnings call, executives did not describe plans to sell any more). Ally Financial is also looking to sell a chunk of mortgage servicing rights, and Wells Fargo could be, too. That all concerns the CFPB, which put out a bulletin Monday saying they might start asking banks that are selling large chunks of mortgage servicing rights to report how they will manage "the related risks to consumers." If the agency thinks the banks are doing it wrong, the CFPB could require the banks to pay restitution to customers, the bulletin says. Community banks increased their business lending across the country in the fourth quarter -- except in the South. While consumer and commercial lending at banks smaller than $10 billion in assets grew 0.78 percent nationally, the Southeast experienced a 0.31 percent decline, according to an analysis by SNL Financial. The South was the only region to contract, as construction and agricultural loans were down sharply. New England had the largest expansion, at 1.66 percent, primarily in home construction. Park Sterling Corp. reported a profit for shareholders of $1.3 million in the fourth quarter as the bank completed its acquisition of Citizens South Bank -- making it the largest community bank in the Charlotte area. The merger closed Oct. 1, giving the combined bank more performing loans and fees from mortgage banking and wealth management that boosted its income, Park Sterling said in a securities filing. The bank also cut $2.5 million in quarterly expenses after the merger. The Citizens South merger increased the percentage of consumer loans -- primarily home mortgages -- in Park Sterling's portfolio from 25 percent to 31 percent. It also nearly doubled the bank's deposits, to $1.6 billion. The bank also set aside about $1 million for bad loans, mostly those acquired from Citizens South. For the full year 2012, Park Sterling earned $4.3 million for shareholders, reversing a loss of $8.4 million in 2011. Park Sterling now has 458 full-time employees across 44 offices in North Carolina, South Carolina and Georgia. Ken Lewis's home sold for $3.15 million. Photo from Realtor.com. After nearly three years on the market, former Bank of America CEO Ken Lewis's SouthPark-area home has sold. The 8,500-square-foot home in a gated community off Colony Road was bought by an Atlanta couple for $3.15 million at the end of last month, according to records with the county register of deeds. The Lewises bought the home in 2003 for $1.7 million, but remodeled or added to it several times before putting it on the market. It originally listed for $4.5 million when it went on the market in early 2010, months after Lewis left the bank. The family still has a home in Charlotte, a 4,800-square-foot Myers Park condo bought in 2010, county records show. Fifth Third is set to try an interesting approach toward bringing people back up to speed on their mortgages: getting unemployed people who have mortgages with the bank new jobs. The bank announced Wednesday a new program with a company called NextJob that will give unemployed mortgage-holders one-on-one career counseling, weekly webinars on things like resume-crafting, and access to job search software. More than half of Fifth Third's mortgage delinquencies come after job losses. It's unclear how many people in Charlotte would be eligible, but Fifth Third's mortgage business is active in the area. The bank and its mortgage subsidiary originated 282 loans for new home purchases in the Charlotte area in 2011, worth a total of $70.7 million, according to the latest data from the Federal Financial Institutions Examination Council. It refinanced 1,286 loans, worth $271 million. New American Mortgage has a new name to go along with its plans for more growth. The company, which has corporate offices in Ballantyne, is now called Movement Mortgage, a change company president Casey Crawford said reflects its philosophy. Movement Mortgage was founded by Crawford, a former Carolina Panthers player, and partner Toby Harris in 2008. It's regularly been on lists of the country's fastest-growing companies. The company has gone from two offices and a dozen employees to 900 workers across 170 locations. Crawford said in a news release that the company hopes to double its sales force over the next year and move into new markets, including Raleigh and Atlanta.